European banks are re-evaluating their digital security strategies. That's a threat to VASCO's short-term sales, but also a strong long-term growth opportunity. 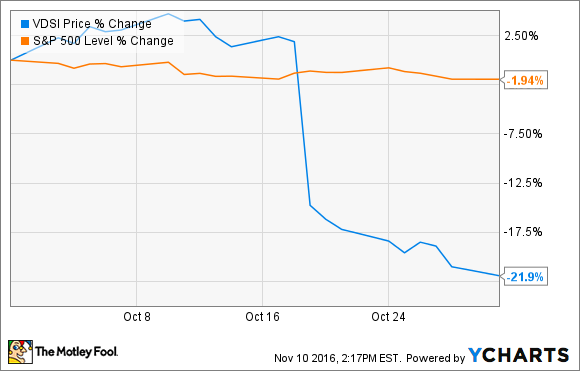 Shares of NASCO Data Security International (NASDAQ:OSPN) fell 21.9% in October, according to data from S&P Global Market Intelligence. The main culprit was a disappointing third-quarter earnings report. On the evening of Oct. 18, VASCO released preliminary results for the third quarter. Sales were pegged at $43 million, far below Wall Street's then-current $51 million average estimate. Management also reduced VASCO's full-year revenue guidance from $210 million to $190 million along with "lower" operating margins. The next day, share prices plunged as much as 22% lower. The full third-quarter report was right in line with VASCO's preliminary release, and the stock hardly moved on the news. Large banking customers in Europe held back on data security orders in the third quarter, adjusting to economic pressure and an urgent need to find new digital transaction and security tools. Many expected orders are now slipping into the next fiscal year or not expected to arrive at all. There's a solid upside to the European ruckus. Those stressed-out banks may very well come back with a profound need for more and better security tools, giving VASCO a chance to win additional business in the long run. Long-term investors should take a closer look at VASCO and its security rivals, ready to pounce on the best security providers while share prices are low. At the moment, VASCO shares are trading 28% lower over the last 52 weeks, with a 15% drop in 2016.